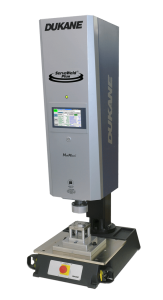 For 50 years, Dukane has been a technology leader in the complex environment of plastic welding, developing solutions that meet the unique requirements of each customer’s application. From customers who know their exact needs, to those that are starting with a new concept, Dukane listens, understands, and delivers a quality product that meets their most challenging welding needs. Plastic welding is the process of creating a molecular bond between two compatible thermoplastics. Welding offers superior strength, and reduces cycle times. There are three main steps to any weld: pressing, heating, and cooling. Plastic welding processes are primarily differentiated by their heating methods. The application of force and allowances for cooling are mechanical considerations which, may vary from machine to machine within the general process category. There are several methods of plastic welding. In this process, the facing surfaces of the two parts are heated through conduction, convection and/or radiation from an actual heated platen. 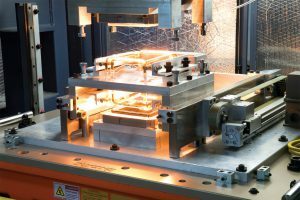 The two parts are either pressed against the hot plate, or held next to it for some period of time, then the hot plate is removed and the parts are pressed together to form the weld. Hot Plate welding typically has weld times from ten to twenty seconds. 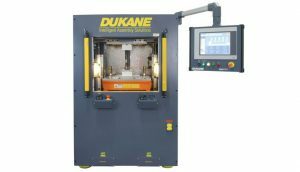 Dukane’s hot plate welders can handle parts from approximately one inch (25 mm) diameter up to five feet (1500 mm) long. Vibration welding physically moves one of two parts horizontally under pressure, creating heat through surface friction that melts and welds the parts together. 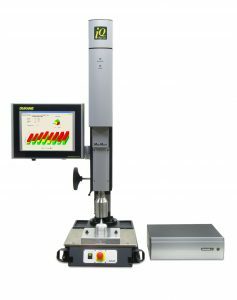 Compared to ultrasonic welding, vibration welders operate at much lower frequencies, higher amplitudes and much greater clamping force. Linear vibration welding is designed with electromagnetic heads that eliminate the wear and lubrication associated with bearing surfaces. 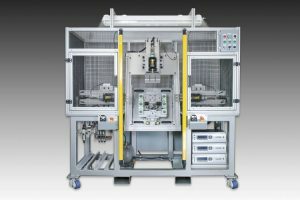 Ultrasonic plastic welding is the joining or reforming of thermoplastics through the use of heat generated from high-frequency mechanical motion. It is accomplished by converting high-frequency electrical energy into high-frequency mechanical motion. That mechanical motion, along with applied force, creates frictional heat at the plastic components’ mating surfaces (joint area), as a result the plastic material melts and forms a molecular bond between the parts. This process works through rotational motion of one part relative to the other. This results in surface friction that leads to heat generation and the formation of a melt layer at the joint. Spin welding typically has weld times from one-half to five seconds. Dukane’s spin welders can handle parts from approximately one-half inch (12 mm) diameter using high speed motors up to nine inches (225 mm) diameter using high torque motors. Custom solutions to meet our customers’ exact welding specifications.